Most chemistry internships for undergraduate students are offered during the summer. Students interested in internships should start looking for opportunities in the Fall as many companies start hiring interns in October. Make sure to take advantage of on-campus career fairs, company visits, and resources provided by Successworks. Covance is one of the world’s largest and most comprehensive drug development services companies, with more than 10,000 employees in 60 countries. Through its nonclinical, clinical and commercialization services, Covance has helped pharmaceutical and biotech companies develop one-third of all prescription medicines in the market today. PPD is a leading global contract research organization (CRO) that provides drug discovery, development, and lifecycle management services. Their clients and partners include pharmaceutical, biotechnology, medical device, academic and government organizations. Life Technologies is a global biotechnology tools company providing premier systems, consumables, and services for scientific researchers around the world. With 35 business units organized into five market segments, 3M tackles real-world problems with an array of inventive approaches, serving customers in diverse fields like health care, safety, office products, and transportation. Summer internships are offered in a variety of areas. The Summer Undergraduate Research Program (SURP) at the Albert Einstein College ofMedicine offers a unique opportunity to work for the summer in a biomedical research laboratory at one of the world’s top-ranking scientific institutions. SURP students attend weekly undergraduate level seminars on “hot” research topics, and also participate in career development workshops and a forum on ethical issues in science and medicine. At the end of the summer, SURP students present a poster describing their research at the annual SURP symposium on the Einstein campus. All SURP students participate in a full range of social activities including attending a Broadway show, a baseball game, Bronx Zoo Day, student-faculty barbeques and various outings. The Amgen Scholars U.S. Program provides hundreds of undergraduate students with the opportunity to engage in a hands-on research experience at some of the nation’s leading educational institutions. Students will have the opportunity to 1) Take part in important university research projects, gain hands-on lab experience and contribute to the advancement of science 2) Interact with and receive guidance from faculty mentors, including some of the nation’s top academic scientists; and 3) Attend scientific seminars, workshops and other networking events. There are 9 universities in the program. Each U.S. host university has its own application process, but the application deadline for all of the universities is in February. Applicants must be U.S. citizens or U.S. permanent residents, enrolled in an accredited four-year colleges, Sophomore, juniors or non-graduating seniors, have a cumulative grade point average of 3.2 or above and have an interest in pursuing a Ph.D. or M.D./Ph.D. Amgen offers internship opportunities in most company functions, including Research and Development, Marketing, Information Systems, Manufacturing and other challenging areas. Our internship and co-op program spans our locations in the United States, Canada, and Puerto Rico. Ashland Inc., a global specialty chemicals company, provides innovative products, services, and solutions to customers around the globe. Ashland has sales and operations in the United States and in more than 100 countries worldwide. Their operations include five divisions: Ashland Aqualon Functional Ingredients, Ashland Hercules Water Technologies, Ashland Performance Materials, Ashland Consumer Markets (Valvoline) and Ashland Distribution. Most of their available internships are for chemical engineering students. The Summer Medical and Research Training (SMART) Program is a nine-week summer research program offered by the Graduate School. From its initiation in 1989, the SMART Program has provided undergraduate students from more than 240 colleges and universities an opportunity to experience research in a medical school environment. Between 80 and 90 positions are available each summer. The size of the program affords a unique chance to work closely with students from many different ethnic, educational and geographical backgrounds who share a common interest in biomedical science careers. Students become functioning members of Baylor laboratories and contribute to research efforts in more than 20 basic and clinical science departments. Students and mentors are matched based on the student’s educational level, laboratory experiences and research interests. At the end of the program, students submit a short summary of their research. Daily noon seminars designed for this program help students develop their fundamental knowledge, introduce areas of biomedical research and emphasize the reciprocal relationship between basic research and clinical applications. A wide range of scientific topics, as well as career options and opportunities for participants interested in research, are explored. Seminar speakers span the range of career development from graduate students to world-renowned scientists and physicians. The Boston University (BU) Summer Undergraduate Research Fellowship (SURF) Program is designed to promote access to graduate education for talented undergraduate students, especially those from minority groups traditionally underrepresented in the sciences. The SURF Program is open to non-BU students who are rising juniors or rising seniors, and wish to conduct research in the sciences, technology, or engineering. The program consists of ten weeks of full-time research in a Boston University lab, mentored by a BU faculty member. On-campus housing, a stipend, weekly enrichment activities, social events, and an October weekend trip to present findings at the BU Undergraduate Research Symposium are also included. Broad scientists use genomic information to study human evolution, population and disease genetics, cellular networks, and the biology and evolution of pathogens. Our research draws on students and scientists from a wide variety of backgrounds, including: Biochemistry, Molecular Biology, Genetics, Chemistry, Physics, Mathematics, Computer Science, Engineering, and Computational Biology. The Summer Research Program in Genomics is designed for non-graduating underrepresented minority (African Americans, Hispanic Americans, Native Americans (including Alaska Natives), or natives of the Pacific U.S. Territories) undergraduate students with an interest in genomics and biomedical research. Students will spend the summer in a laboratory at the Broad Institute, where they will perform original scientific research. The program also features components to support both academic and scientific growth, including scientific seminars, a journal club, and workshops on scientific writing, graduate admission, and fellowships. Housing, travel, and a stipend are provided. Caltech is committed to promoting diversity within its educational programs and activities and strives to ensure that differing cultural, ethnic, social, geographic, and economic perspectives are represented. Caltech’s WAVE Fellows program aims to foster diversity by increasing the participation of underrepresented students in science and engineering Ph.D. programs and making Caltech’s programs more visible and accessible to students not traditionally exposed to Caltech. The program is extended, but not limited, to underrepresented minorities, women, first-generation college students, geographically underrepresented students, educationally and financially disadvantaged students, and students with disabilities. This program is open only to visiting (non-Caltech) students. CMOP offers paid undergraduate internships headquartered at Oregon Health & Science University’s Marquam Hill campus in Portland, Oregon. Interns receive a stipend of $4,600 and out-of-state students may be eligible for additional housing support at a local apartment complex. CMOP considers applications from undergraduate freshmen, sophomores, juniors, and seniors with backgrounds and majors in biology, chemistry, computer science, engineering, environmental science, mathematics, physics, and others. Prior lab/field experience is of interest but not required. Our past interns have come from a wide range of geographic and academic backgrounds, and have worked collaboratively in several innovative projects. Corning’s internship program provides students with an opportunity to learn on-the-job skills and gain business experience at a Fortune 500 company. Not only does their program provide a firsthand look at a career field, but also it provides an opportunity to network with professionals and fellow interns, strengthen academic skills, build resume credentials for future job opportunities. Assignments are available at Corning’s U.S. locations. During the summer R&D internship at Dow, students work closely with a senior scientist in order to improve technical skills in an industrial setting. Interns are part of a team responsible for the development of novel agricultural products. Qualified interns are pursuing a B.S. or M.S. in biology, chemistry, informatics, or closely related majors. Applicants who have completed at least their junior year are preferred. A chemistry intern candidate having a working knowledge of organic synthesis and/or experience with modern chromatographic techniques is desirable. Good interpersonal, communication, organizational, teamwork, and time management skills are essential. Applications are due December 31. Faculty in the Division of Environmental and Biomolecular Systems at the Department of Science and Engineering in the OHSU School of Medicine seek motivated upper-level undergraduate students who are interested in hands-on research in preparation for graduate school in a related field of science or engineering. Students will have opportunities to interact with faculty, post-doctoral, doctoral and masters students while learning new skills and contributing to scientific research. The U.S. Environmental Protection Agency (EPA), as part of its Greater Research Opportunities (GRO) program, is offering Greater Research Opportunities (GRO) undergraduate fellowships for bachelor level students interested in environmental fields of study. Subject to availability of funding, the Agency plans to award approximately 30 new fellowships. Eligible students will receive support for their junior and senior years of undergraduate study and for an internship at an EPA facility during the summer between their junior and senior years. The fellowship provides up to $19,250 per year of academic support and up to $8,000 of internship support for a three-month summer period. This is a program for rising sophomores and juniors who are interested in biomedical sciences and may be considering an M.D./Ph.D. program. This 8-week, paid summer program places students in OHSU research labs to provide hands-on experience, mentoring, and the association of graduate students, professors, and other like-minded undergraduates. Women and minorities are strongly encouraged to apply. ExxonMobil is a major producer of petrochemical materials that form the building blocks for the endless range of chemicals one encounters in everyday life, such as packaging material, plastic bottles, synthetic rubber, solvents and other consumer products. Internships are available, although most opportunities are for engineering students. As an intern at IBM Research, you’ll have the opportunity to collaborate with scientists at the bleeding edge of technology, solving real problems to make the world work better. Intern projects have resulted in academic publications, patents, advanced prototypes that get showcased at leading trade shows, and new capabilities in IBM product offerings. This program gives undergraduates an opportunity to spend 10 weeks during the summer doing a variety of chemistry, biology and engineering research in the lab of a mentor at Janelia Farm. The scholars are encouraged to attend weekly seminars and other events at Janelia. At the end of the session, each scholar will present his or her work at a symposium. The Summer Internship Program (SIP) provides experience in research laboratories to students of diverse backgrounds, including underrepresented minority students, students from economically disadvantaged and underserved backgrounds and students with disabilities that have completed one – two or more years of college. The purpose of this exposure to biomedical and/or public health research is to encourage students to consider careers in science, medicine and public health. The program runs ten weeks and a minimum stipend of $3,000 is provided. Housing is provided near our undergraduate campus; the University has a shuttle service that provides convenient transportation between the Johns Hopkins Medicine Institutions (JHMI) and the undergraduate campus. L’Oreal beauty brands include Maybelline, Lancome, Ralph Lauren, Matric, and Redken. Candidates must be juniors or seniors and be working towards a bachelor’s degree in chemistry, materials science, physics, chemical engineering or behavioral sciences. Internships are usually located in Clark, N.J. or Redmond, Wash. The MIT summer research program in the Biological and Biomedical Sciences (MSRP Biology) is a 10-week training program for highly motivated undergraduate sophomores and juniors who will greatly benefit from an intensive research experience at a top notch research institution. Students will conduct research under the direct supervision of a research mentor in a field of their interest and will learn a range of skills, both technical and intellectual, that will help them develop into successful scientists. In addition to their research training, students will have many opportunities to participate in academic and social activities and become integral members of the MIT community. Each year, 90-100 undergraduate students from around the U.S. go to Mayo Clinic in Rochester, Minn., to work beside both young and established scientists on a broad range of biomedical research questions. A limited number of fellowships are also available at the Mayo Clinic campuses in Jacksonville, Florida and Scottsdale, Arizona. The Summer Internship Program (SIP) at NIH provides an opportunity to spend the summer working side-by-side with some of the leading scientists in the world in an environment devoted exclusively to biomedical research. The Sackler Institute of Graduate Biomedical Sciences and the Office of Diversity Affairs invites applications from students to participate in a summer research internship program in the biomedical sciences at NYU Langone Medical Center (NYULMC). The purpose of the program is to give students who may be interested in pursuing careers in the biomedical sciences (PhD, MD or MD/PhD) the opportunity to conduct research and to be exposed to the excitement of an academic medical environment at a major research center. Each student receives a research project with an established scientist mentor and present their work at the end of the program at the Leadership Alliance meeting and at a poster session/reception. P&G brands touch nearly 5 billion of the more than 7 billion people on the planet today. They offer several summer R&D internships at many different locations for students majoring in chemistry, engineering, and/or the biosciences. Prizer offers value-added, high impact internship opportunities. They recruit from a diverse pool of top-ranked candidates who are currently enrolled in graduate and undergraduate programs in the U.S. and Puerto Rico. The Research Experiences for Undergraduates (REU) is a program that supports active research participation by undergraduate students in any of the areas of research funded by the National Science Foundation. Students involved in the REU travel to the host institution for five to 10 weeks during the summer and work on a specific research project, where he/she works closely with the faculty and other researchers. Students are granted stipends and, in many cases, assistance with housing and travel. There are several institutions across the US and the world that currently have REU programs. To apply, applicants must contact the individual sites for information. Although each site has a different deadline, most applications are due in February. Applicants must be citizens or permanent residents of the United States or its possessions. Rockefeller University invites sophomores and juniors to apply for a summer research opportunity. The 10-week Summer Undergraduate Research Fellowship (SURF) program allows students to work with leading scientists in a broad range of areas including biochemistry, structural biology and chemistry; molecular, cell and developmental biology; immunology, virology and microbiology; neuroscience; physics and mathematical biology. Additional program features include: a faculty lecture series organized especially for summer fellows, a journal club, workshops on presentation skills, interview skills and applying to graduate school, and social activities. The summer concludes with a poster session where summer fellows present their work to the campus community. RiSE (Research in Science and Engineering) is sponsored by Rutgers University, one of the nation’s leading public research institutions. We choose 50 outstanding undergraduates from across the U.S. and its territories to participate in 10 weeks of cutting-edge research in the biological, physical, and social sciences, math, engineering, and exciting interdisciplinary areas under the guidance of a carefully matched faculty mentors. An RD&E Internship at SC Johnson not only gives you a chance to learn about consumer products, but also offers an opportunity to work with other functions within and outside of RD&E. You’ll learn how each function contributes to the development of a product, from innovation to ideation to marketing. SC Johnson is looking for students majoring in chemistry, engineering, or biosciences. This program consists of a prestigious 10-12 week Industrial Internship for Chemistry and Chemical Engineering Undergraduates. SCI Scholars receive $6,000–10,000, a certificate and an additional $1,000, which can be used for any purpose such as participation at an ACS or AIChE meeting, and will be asked to nominate a high school chemistry teacher for recognition. Teachers will be awarded a certificate from SCI and $1,000, which can be used for professional development or classroom materials. Exceptional sophomores and juniors majoring in chemistry and chemical engineering can apply. Applicants must be a U.S. citizen or permanent resident with a minimum GPA of 3.5. SCI Scholars are selected based on their statement of interest in an industrial internship, and letters of recommendation. Applications are due in November. Top science students are invited to apply for the NIH/NCI-funded Pediatric Oncology Education (POE) Program. The program offers an opportunity for students preparing for careers in the biomedical sciences, medicine, and pharmacy to gain biomedical and oncology research experience. Undergraduate POEs participate in basic oncology research, clinical and basic research conferences and a daily core lecture series designed specifically for POEs. A primary goal of the POE program is to encourage students to pursue a career in cancer research. We are particularly interested in highly qualified students with a serious career interest in cancer research, either as a clinical scientist or laboratory-based research scientist. All participants create a presentation on their research project and submit a report on their research project. The University of Colorado Cancer Center, one of only 40 NCI-designated comprehensive cancer centers, offers opportunities for students who are interested in exploring careers in cancer medical research through our Student Cancer Research Fellowship Program. The 10-week summer fellowships pair students with preceptors from a variety of laboratories and clinics at University of Colorado Hospital, University of Colorado Denver, University of Colorado Boulder and other Denver-area health care institutions. Fellows attend twice-weekly lectures and participate in a Poster Session in August. 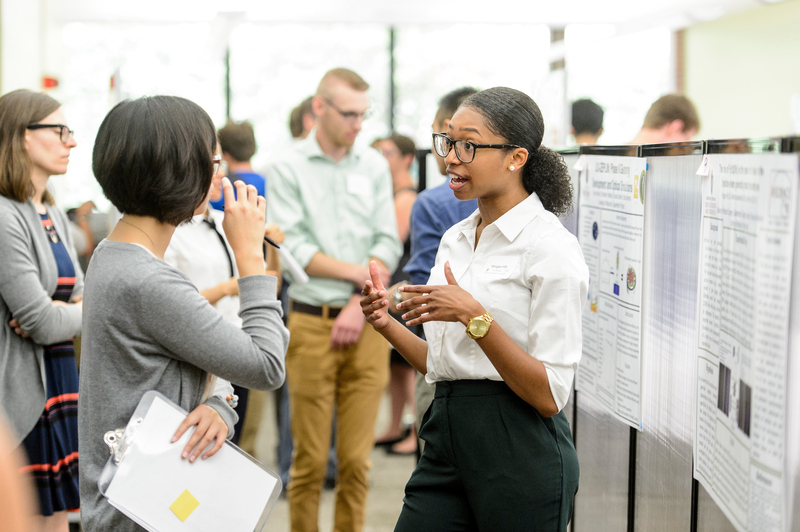 The Summer Undergraduate Research Fellowship (SURF) program at UT Southwestern is an intensive, 10-week summer research training experience designed for college students who are preparing for careers in biological research. 75 fellows gain experience in modern research techniques, and have a chance to plan and execute an experimental strategy to answer a scientific question. The program introduces students to the sorts of projects encountered during postgraduate research training and leads to an understanding of the planning, discipline, and teamwork involved in the pursuit of basic answers to current questions in the biological sciences. 290+ participating faculty offer training in genomics, cancer biology, computational biology, developmental biology, molecular genetics, structural biology, cell biology, chemistry, systems biology, pharmacology, microbiology and infectious diseases, neurosciences, immunology, and mechanisms of disease. SURF fellows participate in weekly research seminars and social events, as well as a university-wide poster session. The QP-SURF program at UT Southwestern is an intensive summer research training experience which leads to an understanding of the planning, discipline, and teamwork involved in the pursuit of basic answers to current questions at the interface of quantitative science and basic biomedical research (including analytical chemistry). Fellows spend 10 weeks pursuing individual research projects in the laboratories of UT Southwestern faculty members. Fellows gain experience in modern research techniques, and have a chance to plan and execute an experimental strategy to answer a scientific question. Fellows present their research at a poster session and attend weekly seminars. Approximately 10 fellows participate in the summer research program. Fellows are selected by the faculty mentors and assigned to a research project according to each fellow’s previous training and research interests.